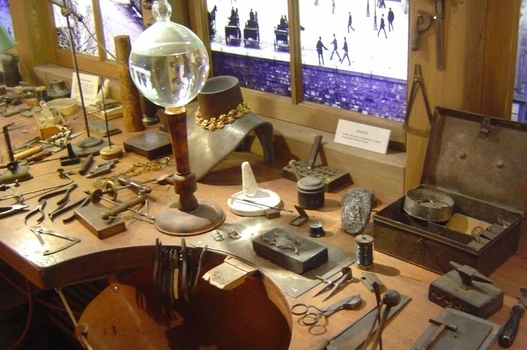 I have established in the hamlet of Ferney a little annex of the manufacture of watches of Bourg-en-Bresse. Our theatre auditorium…has been transformed into workshops. There, where once we recited verse, we are now melting gold and polishing cogs. We must build new houses for the emigrants…We must remember that everyone nowadays wants a gold watch, from Peking to Martinique….Sensitive souls will be happy to learn that sixty Huguenots live so well with my parishioners that it could not be possible to guess that there are two religions here. In 1770 the ongoing political conflict in Geneva resulted in an influx of natif watchmakers across the French border into Ferney, where the aged Voltaire was sympathetic to their cause. Voltaire had initially advocated the development of the nearby village of Versoix, on the shore of Lake Geneva, as a rival French commercial centre. 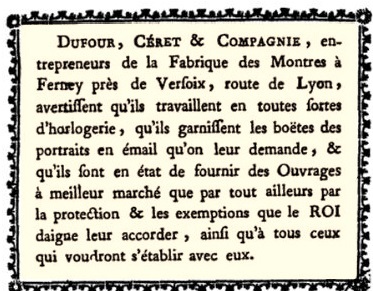 His first reference to “the manufacture of watches at Ferney” comes in March 1770; he seems rapidly to have jumped to the conclusion that the enterprise could become "a very large business"; within six weeks he was already was sending boxes of watches to the duc de Choiseul in Paris. He soon boasted that he had forty workers "telling the time to Europe". At its height the Ferney manufactory consisted of five separate watchmaking partnerships, assisted by myriad of artisans in ancillary industries: case-makers, finishers, jewellers, enamel painters - according to Voltaire, fifty pairs of hands were needed to make a single watch. These small enterprises were named after the watchmakers: Dufour & Céret, Valentin & Dalleizette, Servant & Boursault - all Genevan "natifs"- as well as the two Frenchmen Panrier & Mauzié, who had already arrived in Ferney prior to 1770. Georges Auzière and his brother - well-known as political activists - were specialist case-makers. Voltaire provided accommodation for the industry, first in the requisitioned theatre, then in small workshops. He also embarked on a major programme of construction within the town, devoting a considerable part of his income to building new houses for the carbinotiers and their families. It is reckoned that in total Voltaire encouraged the construction of some 78 houses. Under his care, the town prospered; in 1781 its tax rating was two-and-a-half times more than it had been in 1752. Despite frail health, Voltaire also enthusiastically - and energetically - took on traditional functions of the Geneva watch merchant or établisseur, supplying capital and raw materials and arranging the sale of the watches. This represented a considerable outlay of capital on his part and the incipient Ferney industry was not without problems; in December 1771 three of the new watchmaking businesses were on the verge of bankruptcy and had to be bailed out to the tune of 80,000 livres. By 1773, however, the industry was well established; it is estimated there were some 600 workers, producing 4.000 watches annually and bringing in around 400,000 livres a year. "Cogs and Pieces" Antique pocket watches. The Ferney watch industry is represented by only fifteen or so watches in public collections - in the Louvre, the Voltaire Institute, the Genevan Museum of Horology [?? is this the Musée des Cabinotiers] and the Brou Museum in Bourg-en-Bresse A few occasionally come up at auction.. The watches bear the names of the particular watchmakers rather than that of Voltaire himself, and the place of manufacture is variously given as "Fernay", "Ferney/Voltaire" or "Fernex". Ferney watchmakers made both watches with a verve escapement and repeater watches. Voltaire boasted that he had one of the best repeater watch manufacturers in Europe working for him; among his most successful models was a gold repeater watch decorated with semi-precious stones called marcasites. This sold for 18 gold louis instead of 30-40 for the same model in Paris; .The Lépine calibre, first made around 1775, was also used at Ferney. The watches were made in silver and in gold, sometimes, for decorative effect, in different coloured golds. As already noted decorative jewels were often employed. 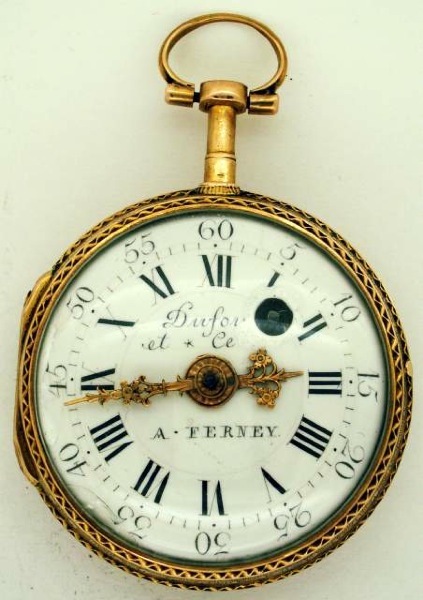 The Ferney manufacture characteristically produced the enamelled watches which were a feature of Genevan production. Voltaire's correspondence mentions a number of portrait watches - of Louis XV, Louis XVI, Marie-Antoinette and her sister; of Catherine the Great; also of Choiseul and the marquis d'Aranda, According to the Watchlords forum, the finest extant example is a repeater watch, now in the collection of the Genevan firm Vacheron & Constantin, signed "Les Dufour et Céret. A FERNEY". The watch is embellished with diamonds and decorated with an enamel portrait of Choiseul. (On 16th July 1770, Voltaire described to the marquis d'Ossun, "a very fine repeater watch....with the portrait of Monsieur le duc de Choiseul". The design is thought to have been based on a copy by Pierre François Marcinhes of Van Loo's portrait of Choiseul). Sadly, I cannot find a photo on the internet. The work was not always of the first class. There were complaints from Versailles that Marie-Antoinette's portrait was unrecognisable. Despite Voltaire's efforts to procure gold from Spain, or even melt down gold coins given as gifts, the watchmakers were sometimes forced to produce watches with a lower gold content than usual. Voltaire made several futile requests for permission to be allowed to use 18-carat rather than the standard 20-caret gold. Not all Ferney watches, however, were very expensive . Voltaire was aware that Genevan watches were considered over-priced and boasted that his were produced more cheaply. He was able to benefit from tax concessions which enabled him to deliver to Paris via Lyon duty free. A surviving price list for the firm of Dufour & Céret started at three or four louis for a basic silver pocket watch, rising to fourteen for a silver repeater watch and forty-two louis for the best repeater watch in gold. Watches over eight-and-a-half-louis came with a two year guarantee (Davidson, p.251). 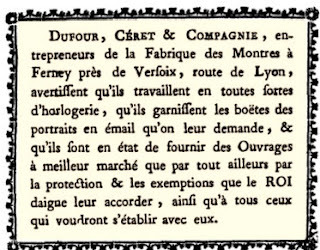 Dufort, Céret & co., entrepreneurs of the Watch Manufactory at Ferney near Versoix, on route to Lyon, wish to advise that they undertake horology of all sorts, that they decorate watch cases with enamel portraits to demand, that they are in a position to furnish their Work more cheaply than elsewhere because of the protection that the KING has accorded to them, and to others who wish to establish enterprises alongside them. Estelle Fallet, "Voltaire's watchmaking legacy", Watch around, no.006 Autumn 2008-Winter 2009. It would seem a luxury watch needs a good pedigree! In 2010 the "Manufacture Royale" brand, was launched by Farmaud Faivre, owner of TEC Ebauche, a Swiss watch component manufacturer, who in 2013 sold on to GNT luxury Holdings. The idea was to echo Voltaire's Ferney enterprise. In fact Ferney claimed to be a "royal" manufactory for only a short period. A royal privilege was not awarded despite Voltaire's entreaties and the title was swiftly abandoned. Sadly the watches do not echo 18th-century design: the link to Voltaire is just an marketing ploy: as GNT carefully puts it,"the main goal was not to benefit from some kind of far fetched historical link but more to position the brand on the values cherished by Voltaire." The 2016 collection of "Enlightened horology" features the "1770 Micromegas" - very expensive and beautifully made - but I am not sure Voltaire would have been that impressed.